The Waterfront Shore is a pet-friendly hotel in the lake-city of Lavasa, which offers accommodation in the form of a studio, 1-bedroom, and 2-bedroom apartments with modern amenities. In addition to their host of facilities, there are several restaurants on-site for you to choose from. To make it easier, we’ve shortlisted 5 restaurants you should check out at The Waterfront Shaw, Lavasa. Oriental Octopus is a casual-dining restaurant, serving Oriental cuisine. Dishes here span across ‘China, Thailand, Korea, Vietnam, Indonesia, Malaysia, Japan and Singapore’ – so you’ll have plenty of delicious options to satiate your appetite. Try their veg spring rolls, panko-crusted prawns, Nasi Goreng, and five-spice chocolate mousse; we’ve heard good things. Service here is quick and pleasant, and the staff are happy to recommend new dishes for you to try. The All-American Diner goes all-out with their retro-diner theme; featuring the classic black-and-white checked floors, posters and enamel plaques, plush red booths, and a diner-style menu. Indulge your tastebuds with their coffee and cocktails, or dive into diner classics like burgers, hot dogs, pancakes, waffles, malts, shakes, and their all-day breakfast. We suggest you head over here for a weekend brunch or go for their 7-course lunch menu – and wash it down with a nice chilled beer. Try Pierre’s French Toast combo, buffalo chicken wings, spaghetti with lamb ragout, and finish up with a brownie blast for dessert. 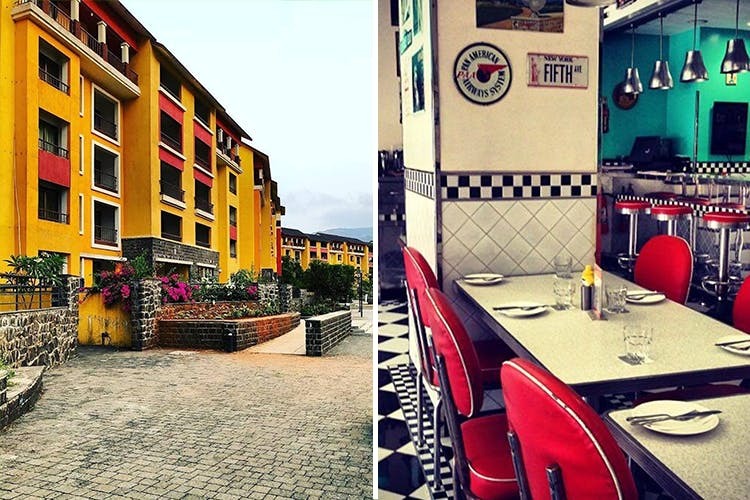 All the way from Mumbai, Revival Restaurant has opened its doors to hungry folks at Lavasa. Serving classic vegetarian Gujarati fare, you can either go for their signature ‘Revival Golden Thali’, or order a la carte. Snacks, meal combos, sweets, and beverages offer a tempting array of items – like ‘dabeli dhokla’, khasta kachori, methi thepla with garlic potatoes and chundo, maag-ni-dal with kadhi-khichdi, gulab jamun, ‘fruit jalebi rabdi’ and more. There are plenty of Jain-friendly options on the menu here as well. For a wholesome meal, we recommend you order the unlimited Thali – served with 3 farsans, 4 veggie preparations, 4 daals and kadhis, one sweet dish, pickles, papad, and chutney. ‘Chor Bizarre’ is meant to be themed after the infamous ‘Chor Bazaar’ – where it’s said you can always find, “a little bit of this and a little bit of that”. A restaurant chain from Delhi, they serve eclectic North Indian cuisine (veg and non-veg) with the decor to match, so there’s plenty to choose from at Chor Bizarre. Pick from starters, chaat, tandoori fare, main course, breads/rice, and accompaniments to replenish your appetite. Chor Bizarre tout themselves as being ‘partial to Kashmiri cuisine’ and so we recommend you try those items first. They also serve a 7-course buffet meal – supplemented by a refurbished vintage car that doubles as their ‘salad and chaat-mobile’! Past Times is The Waterfront Shaw’s English pub-themed bar, serving finger-food, mocktails, and of course – alcoholic beverages. From chakna like masala papad, to chilli cheese toast, and more substantial bar bites like shawarmas and tandoori kebab platters – we think this is the ideal spot for drinks with friends or a quiet date night. If you’ve got a sweet tooth, don’t miss a stop at ‘Granma’s Homemade’ – a New Delhi bakery and dessert parlour that has also made it’s way to Lavasa. They serve everything from ice-cream sundaes and milkshakes, to hot tea and coffee, cheesecake, pies, tarts, cookies, doughnuts, cakes, breads, assorted pastries, and ice creams. Situated right on the promenade, it’s a picturesque setting for a quick bite or an after-meal treat.